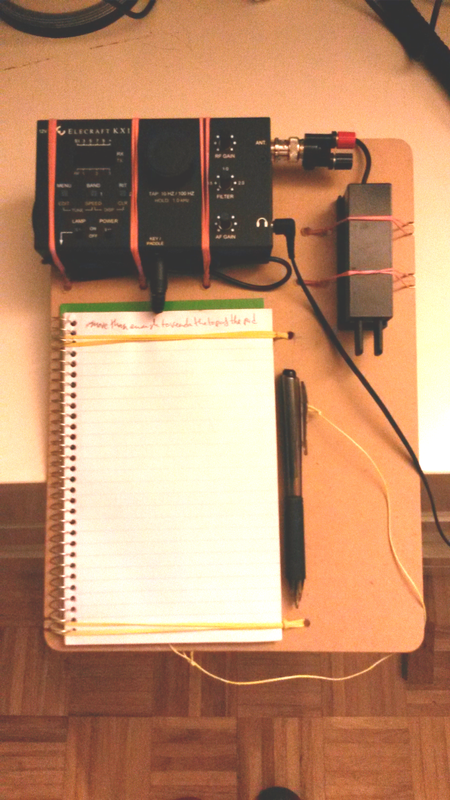 This post is all about ham radio, the great outdoors and being thrifty (cheap). No computers were harmed in the making of this post. My primary radio is an Elecraft KX3 — very capable and very portable. At Lobstercon the KX3 was happy to operate connected to a big gel cell and an end fed half wave antenna thrown up into a tree. While at Lobstercon this year I got to talk at length to Carl WA1ZCQ and Pete N1ABS about operating en plein air, and the subject of Summits on the Air came up. Summits on the Air, or SOTA, is an operating exercise that originated in the UK and is very popular in Europe. It is starting to catch on in the States. Lists of summits, which include everything from 300 foot hills to the top of Mount Washington, are assigned identifying codes, and points which reflect the relative difficulty of operating from that summit. An activation consists of announcing your intention to operate from a particular summit at a particular time (there is a web reflector for this), going there, and making at least four contacts in whatever bands/modes you fancy. Other operators log these contacts, accumulate points, and qualify for awards. Good clean outdoor ham radio fun, and an great fit for anyone who likes to operate outdoors with minimal (e.g. lightweight and portable) equipment. QRP heaven. I have been wanting to do this for a few years now and have not gotten around to it, but this year I am psyched. There are a few summits (hills) not too far from the upstate QTH that have never been activated! Probably for some very good reason that I will discover on the day I attempt one, but heck, it’s just too tempting. So I am back from Lobstercon, and idly surfing the net looking for material relating to SOTA operating, and I come across a youtube video review of a very interesting looking product. Offered by a company called SOTABeams, and called the “Flight Deck”, it is a small plastic board with strategically placed holes and notches, which allow you to secure your miniature radio, paddle, notebook and pen to one easy to manage object. Very classy. I know from experience that it is very easy to have your stuff go astray when you are sitting on a windy rock with wires attached while trying to listen and key and write things down. I have trouble with this indoors sitting at my operating desk, and there is no wind. I have not named this device as yet. I started with a common fiberboard clipboard, and removed the clip by drilling out the rivets. Using the images online as a guide, I drilled pairs of holes to secure the rubber bands mid-board, and using a Dremel tool with a cut off wheel, cut generous notches to capture the other ends of the rubber bands. Happily, I already have a KX1, and a very nice Palm mini-paddle, and in about an hour had a very serviceable, if not as pretty operating desk for field QRP. The one exotic touch is that my pen is attached to the board with genuine Kevlar twine, which I had on hand from a totally unrelated project. That sucker is not getting away, regardless of the wind speed. So I actually tried this setup out in my backyard, with a 42 foot wire and a 16 foot counterpoise attached to the KX1, using the KX1’s built in tuner, and it worked beautifully. It was very easy to manipulate the radio and the paddle, and by the end of the test I had not lost anything. I highly recommend buying or building one of these things if you operate outdoors. a 10AH gel cell battery, which would power operation for about a week, but weighs as much as a lawnmower. I get about 3 watts out of the KX1 with this. a battery pack made out of 10 AA NiMH cells. Still kinda heavy, and I get slightly less power out. 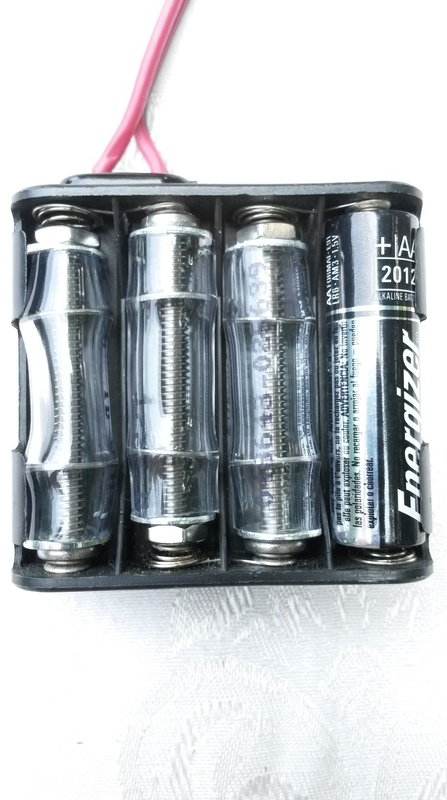 6 primary lithium batteries in the internal holders of the KX1, which gives about 9 volts and an expected 1.5 watts out. I haven’t tried this yet, but the lithium’s are pricey, and my KX1 seems to output a little less than nominal power. So I started looking around the web, because I know folks have made modifications to the internal battery holders of the KX1 to allow running higher power. I found this video by K4LXY about using rechargeable Li-PO cells that produce 3.7 volts each. He made an easily reversible mod to the KX1 battery holders to eliminate 3 of the 6 cells, getting about 11 volts from the 3 rechargeable lithium cells. Although the cells he used are initially quite expensive, they can be recharged hundreds of times making them very economical. This seems a very good solution, as it also eliminates the need for a power cable and external power source — less to carry. In his video he shows a dummy cell made of a dowel, and another made of a fuse and holder, along with a shorting wire to eliminate one of the two 3-cell holders in the KX1. He also provided a plastic sheet over the whole thing to insure nothing would short against the dummy cells. 1 length of vinyl tubing, 1/2 inch OD 3/8 inch ID, exactly 1 3/4 inch long. I used stainless steel hardware for mine, but actually anything would do. Except nylon. 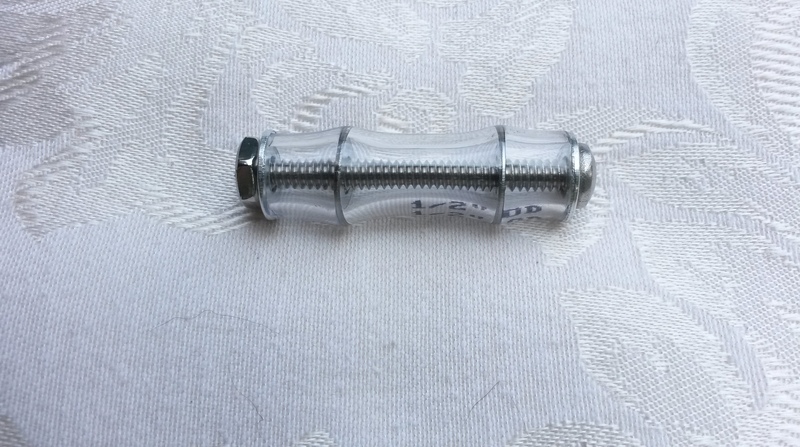 Do not make these with nylon bolts. Cut the bolt to 1 7/8 inch using that screw cutting hole in your wire stripper that you never use. 1/8th inch of the bolt is about two threads worth. Cut a length of tubing 1 3/4 in long. This is a critical measurement. Try to get the ends nice and square. It may take a few tries to get this procedure down. You did buy 2 – 3 feet of tubing, didn’t you? Place a 3/8 washer over the end of a closed pair of needle-nose pliers, and maneuver it into the tubing about a half inch in from the end, and perpendicular to the axis of the tubing. You can use the bolt in combination with the pliers to get it sitting correctly. Do this again from the other end. Place a 1/2 inch washer on the machine screw, then the tubing assembly, then a 1/2 inch washer and finally, compressing the tubing a little, start the nut on the screw. Tighten the nut until about 1/16th inch protrudes from the nut. This tensions the tubing enough that the nut will held in place and not loosen. Well there it is. Later on this summer I will get a hold of some rechargeable lithium’s and I will be good to go. Ah, I forgot to mention: these dummy cells are guaranteed not to leak. Ever. This entry was posted in Ham Radio and tagged KX1, Li-PO, LobsterCon, QRP, SOTA, Summits on the Air. Bookmark the permalink. Hi Michael, Glad to see you are interested in Ham Radio. I have been a Ham for 74 years and still going strong. Can we setup a video/conversation on FaceTime, Skype or Google?